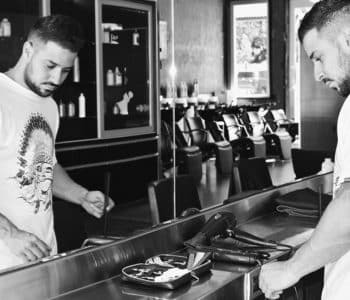 Business owner, Michael Pierro carries 10 years of experience in the hair industry, giving him the confidence to successfully meet the challenges to run a successful salon. Michael developed his own hairdressing technique and skill set by virtue of apprenticeship, and later advances as Executive Stylist and Salon Manager, at Fruition Hair. As a precision hair cutter, Michael built a reputation cutting and styling naturally curly textured hair, using a free hand, curl-by- curl cutting technique. Michael is constantly sought out for his finesse and impressively tames and styles any texture of hair. He also traveled internationally as an expert stylist, assisting on several editorial photo shoots in Rome, Milan and Dubai, under the creative guidance of Craig Smith. Michael has even been apart of Smith’s Project Feel Good, a non-profit program aimed at providing disadvantage children in Vietnam the opportunity to learn the hairdressing trade to create job opportunities, stability, and independent living. These priceless experiences and growth shape Michael’s invested interests and future endeavors. His knowledge of his team’s skills and capabilities paired with his friendly and vibrant approach to training and advancing the team’s knowledge have contributed greatly to his success in creating a salon, that delivers exceptional service to clients. From his early days as a hairdresser to his present role as entrepreneur, Michael continues to challenge himself. He keeps himself inspired and versatile through continued education and has completed such advanced courses at the world-renowned Vidal Sassoon Academy in Los Angeles. As the salon evolves, Michael attends industry events, giving him an opportunity to meet other professionals in the broader fashion industry to discuss ideas for future collaborations and promotions with Hair By The Collective.